Talofa Lava and Welcome to this important and historical occasion for our people and our country. Today marks a historical milestone for our country and our airline, Samoa Airways. This is indeed a momentous occasion and this development is one that our country needs and should have done a long time ago. Tomorrow, Samoa Airways will launch its maiden flight to Auckland, New Zealand, and those on-board will enter the record books as the first passengers on-board the first flight of Samoa Airways to leave our shores. This vision and goal has now been realised after Government made a decision in May/June this year, to withdraw from the Joint venture with Virgin. 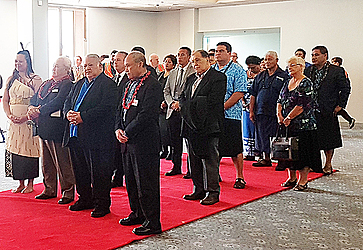 It was a decision based on sound and well researched studies which pointed to Samoa starting up its own national Airline in Partnership with another regional airline. It has taken a very short time for our airline to do what usually takes 24 months to establish and I congratulate the Board and the Management of Samoa Airways for their commitment and fortitude in the face of many obstacles to get the airline up and running so quickly. Samoa is an isolated Island nation surrounded by water. Air transport is a vital link for Samoa and we need to have reliable and safe air travel for our people. Many have asked why are we doing this, why do we need to have an airline and why not leave it to others. Samoa can no longer rely on others to determine our destiny in terms of air travel, we can no longer sit back and let others dictate to us what’s best for our people and this country. Having our own airline ensures that we will be able to determine our destiny. Having our own airline will create jobs and will contribute to the economic growth of our country through increase exports and also contribute to increasing tourist to our country. Something that was not done under past arrangements. When I have been asked the question why are we going down this road, why now? I often ask the question back, “If not now, when and if not us, who.” No one else will look after our countries needs but us. If we do not do it now, it will never be done. If you look around our region, From Vanuatu to the Solomon’s, Nauru to Kiribati and Tahiti to Fiji. Our neighbours have their own national airlines and they have maintained their airlines successfully and profitably. If others can do it why can’t we. Why can’t we. The answer is we can. The airline has moved into a new era, with new thinking and new ideas, new ways of doing business. The past lessons have been well learned and they will not be repeated. We want an airline that is efficient and run professionally. We as a country must embrace what is ours, we must embrace the national carrier and support it. Look at Fiji, Vanuatu the Solomon Islands, Nauru, Tahiti etc. They support their airlines and they have airlines that are not only making money but contribute to the economic growth of their country. Our own airline is dedicated to using all our local products on its flights and will provide a service with a touch of our Faa-samoa, our hospitality and service. Our airline has entered into a partnership with Fiji Airways and will soon provide connectivity through Samoa to the United States on a code share basis. It will partner with Fiji Airways to Asia, Europe and beyond. I thank the CEO of Fiji Airways for your support and assistance in this project. This is type of project is something we have been trying to do with other airlines for many years, without any positive response or assistance. In fact services were removed from Samoa as these other carriers were asking us to pay millions in subsidies each year just to come through Samoa. This is not lost on us and we will be relooking all of the Agreements, Samoa has entered into to reassess if we really do need to be in Multilateral Agreements, when our neighbours have maintained their Bilaterals. We have entered into these Multilaterals to our detriment. They were good once not now. Samoa needs to really look and reassess its Bilaterals. Our Neighbour Fiji is the best example where they remained with individual Bilaterals and their airline posted almost 100 million FJD profits the last financial year. That is impressive for a small island country. Today is a special occasion and we are here to celebrate and showcase what a small island country like Samoa can do once we focus on what is important to us as a nation. To our business community, come and support our national carrier and show that we can do this together. To the thousands of Samoans in New Zealand, Australia and the United States and the world, Support your Samoa owed airline and come home on our national carrier. To all travel agents, thank you for working with the national carrier to get passengers to fly Samoa Airways. The one certainty in all this is that revenue generated by our national carrier will stay in Samoa, it will not be sent overseas. Airlines flying to Samoa are posting close to a billion dollar profits, none of that comes to Samoa. It all stays overseas. The new Faleolo Airport Development is something we can also be proud off. The Airline and the S.A.A. are intertwined, and each helps the other to progress and grow in a symbiotic way. With aviation facing ever greater and fiercer competition in the years ahead, it will become even more crucial for both Samoa Airways and S.A.A. to think ahead, develop strategies to meet future challenges, and prepare themselves for tougher market conditions. I am sure that you will rise up to this challenge. I call upon SAA Board to assist the airline to get up and going and provide all the support you can to our national carrier. It is time that we stand up and it is time that we support our own airline and support Samoa. We are at the tipping point and your support will ensure that Samoa Airways grows and Samoa grows. We have a beautiful country with so much to offer, now we can grow and showcase the beauty of our country our culture and our people. To our airline management and staff, this is the time to work as professionals, to act as professionals, to put your best foot forward, to show case Samoa and its airline to the world. Do it right, do it properly and make the airline profitable. The Government has not given the airline any funds to start the airline as you must run it as a business. You have had 12 years of running the smaller Airline profitably, Show that with the jet services. Give it your best. Prove that we can do this and do it well. I urge our people and our country, come and support your national carrier. Be proud of what Samoa can do. I take this opportunity to thank Icelandic airlines and NEOs for their support during this time. To conclude, I would like to congratulate SA for the launch of the Boeing 737-800 NG aircraft. I wish all of you on-board this inaugural flight an enjoyable and relaxing time. Have a good flight! I wish the airline every success and I thank all those that have supported this vision to make it a reality today. This magnificent plane painted in our colours will proudly fly our flag and transport our people and visitors to their destinations and bring them to our home.